By LaGayle ~ July 18th, 2012. Being native Texans, the Wine Peeps love BBQ. Real BBQ, that is! There is a distinct difference between real BBQ and just anything cooked on a grill outside. Hamburgers and hot dogs are not BBQ; neither is roast beef with lots of BBQ sauce slathered on top. Real BBQ is smoked by slow-cooking the meat for hours in a pit over indirect heat. And let me tell you, it is so good! Since moving to Seattle many years ago, it is the rare occasion that we are able to enjoy real BBQ. So once a year on the Fourth of July, I cook a complete Texas BBQ meal. I use mesquite wood and charcoal in the firebox to the side of the grill holding the meat and the smoke goes from the firebox through the grill/smoker section and out through a â€œchimneyâ€ that is located on top of that section at the opposite end from the firebox. 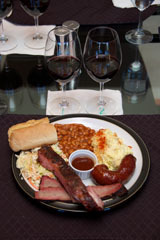 While Shiner Bock beer is always a great choice to enjoy with Texas BBQ, we decided to see what wine would pair well with the BBQ for this monthâ€™s challenging wine pairing. Our BBQ meal included beef brisket, pork ribs, and sausage. It was rounded out with potato salad, baked beans, coleslaw, garlic bread, and banana pudding. To determine which wines to try, once again I referred to my favorite resource, What to Drink with What You Eat by Andrew Dornenburg and Karen Page. 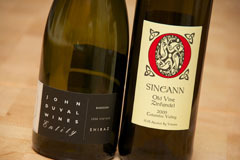 I decided to try a Shiraz and a Zinfandel and selected the 2008 John Duval Entity Shiraz from Australia and the 2009 Sineann Old Vine Zinfandel from Oregon. Both wines were very good; however, the unanimous choice as the best pairing with the Texas BBQ was the Shiraz. The Shiraz had more tannins and held up better with the smoked meats. 2008 John Duval Entity Shiraz (Barossa Valley, Australia): Deep, dark purple black in color. Very aromatic with leather, spice, and smoke on the nose. Black fruits, leather, and spice come through on the palate. Medium to full-bodied with lively acidity and medium to high tannins. Well-balanced with a long, lingering finish. 2009 Sineann Old Vine Zinfandel (Columbia Valley, Oregon): Dark purple black. Nice nose with blackberry jam and smoky aromas. Very jammy with blackberry and chocolate on the palate. Medium to full-bodied with crisp acidity, medium tannins, and a very long finish. Makes me want to run to Cooper’s in Llano to get my brisket right out of the pit! Being a transplant from the midwest, I also struggled to find real BBQ. Happily, I found Stan’s in Issaquah. Stan does Kansas City style BBQ. The meats are smoked for hours and fall off the bone. While a Boulevard Brewing Zon pairs fantastic with the ribs and might just be on tap at Stan’s, I have found that Syrah is indeed a good choice. Stan’s takeout and some syrah. Thanks! Enjoy that yummy brisket you can get in Texas. Glad to hear that you’ve found Syrah/Shiraz to be a great pairing with BBQ as well. Thanks for recommending Stan’s. We’ll have to check it out. I have often enjoyed petit syrah and bbq. Both have such concentrated flavors that it seems to work well, just like syrah. Tobin James in paso has done very well with their petit syrah on a qpr rating in my book. This past weekend, my husband and I participated in the North Sierra Wine Trail – on the trail, one of the stops was a small vineyard, Grey Fox. They had a wine I thought would pair perfectly with BBQ – Barbera. It might be worth looking into. Their direct price was $16 and their wine club price was $11. Thanks for the Petite Sirah recommendation. We’ll have to try it with our BBQ sometime. Glad to hear you enjoyed the trail. Thanks for suggesting Barbera. It is a fabulous food wine and does well with a number of different types of food.